This building, also known as the Kennedy Farmhouse, was the headquarters from which John Brown (1800-1859) planned and executed his raid on the Federal armory at Harpers Ferry in October 1859. Along with a small band of followers, he rented the two-story Kennedy farmhouse, located approximately seven miles from Harpers Ferry, from the heirs of William Booth Kennedy. 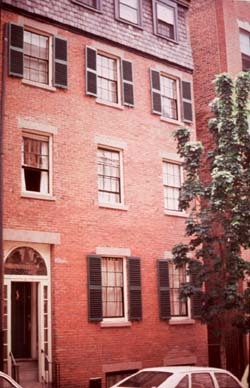 During the three months leading up to the raid, Brown divided his time between Chambersburg, Pennsylvania and this farm, living under the alias of Isaac Smith. The Kennedy Farmhouse served as the center of operations where Brown stockpiled weapons and tools and pondered maps and vital statistics. 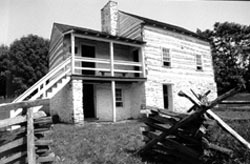 Other than the engine house at Harper's Ferry where Brown staged his final defense, the Kennedy Farmhouse, a National Historic Landmark, is the building most closely associated with the raid. John Brown's Headquarters is located at 2406 Chestnut Road in Samples Manor, Maryland. Privately owned, it is open to the public by appointment. Tours can be arranged though the Headquarter's website, or by sending an email to jbrown1859@aol.com.